وجه العملة تمثال للملكة اليزابيث الثانية وعبارة "اليزابيث الثانية استراليا 50 دولار2/1 أوقية 999 ذهب 2012"
ظهر العملة رأس التنين الصيني التقليدي الملون ، عبارة "سنة التنين" ورمز للتنين. تمثال للملكة اليزابيث الثانية وعبارة "اليزابيث الثانية استراليا 50 دولار2/1 أوقية 999 ذهب 2012"
رأس التنين الصيني التقليدي الملون ، عبارة "سنة التنين" ورمز للتنين. 2/1 أوقية 2012 من العملات الذهبية الخاصة بالتنين الملون من دار بيرث للسك This limited mintage,unique bullion coin features a artfully design of the head of the traditional Chinese dragon. These coins were originally intended for the Asian market. 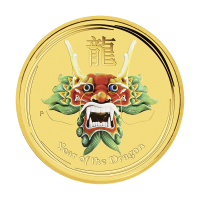 For 2012 the Perth Mint's internationally renowned Australian Lunar Gold Coins celebrated the Year of the dragon, the Fifth animal in the 12-year cycle of the Chinese zodiac. These superb quality releases are perfect for people born in "Dragon" years - 1940, 1952, 1964, 1976, 1988, 2000 and in 2012 - who are regarded as confident, enterprising, independent, self-assured, brave and passionate. The Chinese character for "dragon" and the inscription "Year of the Dragon" also appear in the design along with The Perth Mint's traditional "P" mintmark, the year and weight. As well as appealing to gold coin collectors, these outstanding releases also make great gifts for people born in any year "ruled" by the Chinese lunar dragon.